Hello my friends. 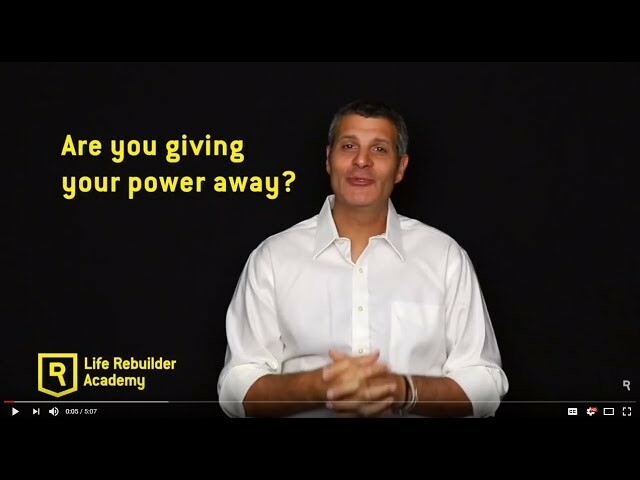 Erez Avramov here, founder of the Life Rebuilder Academy. Welcome to another episode of the Life Rebuilder Show. Today our subject is giving your power away. This is a sensitive subject for some of us because I find that sometimes we are not aware of how we actually give our power away on a day-to-day basis. So today I want to explore this a little bit with you and give you a couple of tips on how to identify where you are and how to hold your ground when it is very important for you to do so. So the reality is that sometimes when we go about our life we encounter certain experts, certain professionals, certain gurus – whatever the case may be that hold a specific body of knowledge or an opinion on how that knowledge should be implemented in our life. Now when we hit rock bottom and a devastating event has happened in our life we are sometimes at the mercy of those professionals and we seek their advice. And because we are not certain of where we are with it we give them the power – sometimes to the degree of giving them so much power as to make the decision for us. I have seen this time and again. I’ve seen this on my journey with medical conditions and situations where certain surgeons had a very strict approach or an opinion that was completely the opposite of what I needed. Not just on a medical level but on a mental and an emotional level too. You alone must make a decision and be 100% certain that you can deal with the consequences because the consequences for a decision are not guaranteed, right? it’s not a black and white situation, “oh I’ll make a decision based on all this information and definitely this will be the result”. Well, this is not how life works. You need to make a decision where you have the power to deal with the consequences no matter what they are, and when I mean we give our power away most of us we do it unconsciously. We think that based on a certain status in society because a doctor wears a gown or because we have somebody in the financial industry that has achieved certain success we assume that they know everything – that they have already figured it out and we just need to take that advice and accept it for what it is and just follow through. Well this is never the case. Your job as an individual, as someone who has personal power to make decisions, is to make the right decisions for you. Don’t get me wrong here, the decisions are based on you being 100% certain that you can handle whatever comes your way. If you give your power away and somebody gives you advice and you follow it and that advice goes against everything that you believe in or create a situation that is horrible in your life you will not be able to handle that. And this is the point for today – this is why it is extremely important for you in every situation in your life to examine it for yourself. Here are two tips that I want to leave you with today. If your answer is no it is because you gave your power away. It is because you expect somebody else to make the decision for you and you will just follow through with the hope that the results will be what they said they should be. But life doesn’t work that way, we know it. it doesn’t always turn out the way we want it. If your answer to that is ‘yes’ then you are on the right path! This may sound a little too simplistic for you, but these two questions have changed everything that I do in my life and has changed many many things in how my clients handle certain situations in their lives, so I invite you to just try and implement these two questions in the next situation you need to handle. Small changes: effortlessly implement small changes today! How To Get Your Life Under Control In The Next 30 Days.